This Sunday the women’s US Olympic Marathon Trials will be run in Boston. NBC is providing a live webcast just like they did for the men’s Trials back in November, a welcome development in the media coverage of distance running. Back then, however, I found myself wondering why the men’s race didn’t get more coverage. It certainly helped that the event was tied to the NYC Marathon, as it will also help the women’s Trials to be partnered with the Boston Marathon. But why couldn’t America’s most competitive, once-every-four-years marathon garner live television coverage? “A” standard – 2:20:00 marathon. “B” standard – 2:22:00 marathon, 28:45 10K track, or 13:40 5K track. One idea to increase public interest in the trials would be to expand the field to about 500-1000 runners. 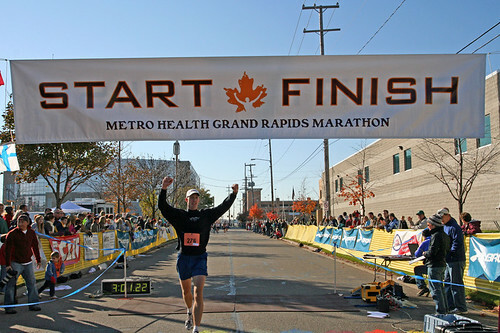 By comparison, the Grand Rapids Marathon fielded 496 runners in 2004, growing to 1396 running the full 26.2 in 2007. Logistically that would require a large course since the field would be more spread out, preventing the convenience of a six-lap course that the women’s Trials will feature. The starting line would have to be strictly seeded by qualifying time to prevent back-of-the-packers from lining up in front of true contenders. Could the aid stations handle such a large field running by within minutes? If by some small chance the Trials organizers are reading this, they would be in shock at the thought of planning such an event. Not only would the logistics be difficult, but financially it’s even more daunting. After all, the men’s Trials in November actually cost more money than it earned despite the NBC coverage. However, a large field could generate more revenue. Rather than set a qualifying time standard, simply choose a field limit (e.g. 500) and in the several months leading up to the Trials a public leader board would create ongoing buzz. Hopeful contenders could check to see where they stand among our nation’s runners and after a cutoff date, only the top 500 are invited to the Trials. With so many runners participating there could be hundreds of towns following their local hero, thousands of friends and family members tuning in to watch their loved one run alongside (however briefly) our country’s eventual Olympians. The longer total course would allow more spectators, and enough marking effort coupled with so many personal ties to the race could create a large following. One example is Joel Klooster. You probably don’t know who he is; in fact, most of the avid runners in my company haven’t heard of him. Truth is, I didn’t know either until I joined his department and recognized my new colleague as the same guy who had won a 5K I’d ran in. Last spring Joel ran his first marathon in 2:30:09! He finished third behind a guy who had already qualified for the Trials (Nathan Usher) and another one who missed by 17 seconds (Nick Allen). He’s no threat to Trials winner Ryan Hall but the point is, would my local office of 1000+ employees watch the Trials if one of our own was running? Maybe. Maybe not. There were at least 19 Michigan runners in the Trials including 13 from the Hansons-Brooks Distance Project. I recall the local TV news broadcast, after the Trials were over, briefly noting that #2 finisher Dathan Ritzenhein (who grew up in nearby Rockford) and Ryan Shay are Michigan natives and that #3 finisher Brian Sell lives in the state. Trials participant Kyle Baker, who lives and races right here in Grand Rapids, didn’t warrant a mention. Extensive archive searching of Olympic sponsor NBC’s local affiliate Wood TV and of Michigan’s online newspaper hub M-Live.com resulted in just one article about the Trials, a story syndicated from the AP. If the city of Grand Rapids, annual host of the 25K National Championship (in which Baker, Sell and Shay all raced in 2007) and home to some elite runners, can allow the Olympic Trials to be virtually ignored by the local media, then perhaps pulling together such a large field wouldn’t create the interest that some envision. Cutting the standard down to 2:19 certainly helps, but I don’t think it’s enough to change the atmosphere of the Trials. USATF estimates that 65-85 will make the cut in 2012 but that doesn’t really change the scope of the race. The field will still consist of a handful of true contenders, another dozen who might place if they run the race of their life, and the remaining 50+ would just be there to get their name on that finishers list. If the current format of the Trials doesn’t seem to interest the general public, reducing the number of relatively unknown runners from 150 to 50 would hardly be noticed. Looking at the qualifying times and results of the men’s Trials, each of the top four finishers had qualified in the top ten, with Ritzenhein qualifying with the 10th best marathon. However, he also had the 4th best 10K during the qualifying period so his performance was certainly no fluke. Jason Lehmkuhle finished fifth in the Trials despite qualifying 49th, the most extreme jump aside from Steve Sundell finishing 15th after qualifying 103rd. Lehmkuhle does have a 2:16:27 marathon PR from a few years ago so he can certainly burn, but apparently couldn’t do better than his 2:19:03 during the qualifying period. If his Trials finish was two minutes faster he’d have made the Olympic team… no offense to Lehmkuhle but he wouldn’t seem likely to threaten a world-class field that easily notches sub-2:08’s. Interestingly, five of the top 11 qualifiers suffered a DNF at the Trials and the #7 qualifier, Fernando Cabada, did not even race (although I’m not sure why). I’m not entirely surprised at the DNF’s – these cream-of-the-crop runners were racing to make the team or bust. If an Olympic team had to be chosen based on history and not on a Trials race, it seems that Ryan Hall, Khalid Khannouchi and Abdi Abdirahman are the strongest marathoners we have. However, it’s important that an athlete be able to deliver on race day and for whatever reason, Khannouchi and Abdirahman couldn’t quite make it while Ritzenhein and Sell proved that they know how to prepare for a major contest. Even faster is even better! My suggestion for invigorating the coverage of the Olympic Trials would be to limit the field to around 25 qualifiers. All but three of the top ten Trials finishers had a top 25 qualifying marathon. Daniel Browne and Josh Rohatinsky finished 6th and 8th respectively despite not posting a qualifying marathon time – instead they had qualified via the 10K, where Browne was the 17th ranked qualifier and Rohatinsky was ranked #10 at that distance. Lehmkuhle did qualify 33rd with his 10K time, but with his 49th-ranked marathon he stands as the biggest statistical surprise in the top ten at the Trials. There were 48 runners who posted a 2:19 or better qualifying time, which would be good enough to meet the new 2012 standard. Even if you’re a die-hard fan of running, you probably haven’t heard of many of those names. Incidentally the #25 qualifier, Jason Hartmann, posted a 2:15:50 and was the “slowest” man to crack 2:16 before the Trials. However rather than using a time-based cutoff, the Trials would simply invite the 25 fastest marathoners during the qualifying period. If your 2:16 happens to place you 26th in the country, then sorry for you but great for Team USA as it means our Trials will feature some truly elite racers. A very fast time standard could be used for an automatic entry, maybe 2:14 or 2:15, where any runner beating that time is guaranteed entry into the Trials. For some background, nine runners qualified for the men’s Trials with times under 2:14 (Ritzenhein was 10th at 2:14:01) and 14 finished under 2:15 (Ryan Shay was #14 at 2:14:58 and Chad Johnson was #15 at 2:15:03). If more than 25 runners can beat 2:15, then the Trials would accept however many meet that standard but it almost certainly wouldn’t be over 30. If the USA wants world-class runners, we might as well require world-class qualifying standards. The big benefit that I see to such a small field is that it allows the public a chance to get to know all competitors. Major League Baseball rosters have 25 players; NASCAR lines up 32 or so cars in a race. Limiting the Trials field to 25 runners means that press kits could include bios of each and every competitor. Maybe NBC could incorporate chip-timed splits live in their TV coverage with real-time updates showing who’s gaining ground, who posted the fastest recent mile, who’s slowing down, etc… much like what NASCAR broadcasts already feature. Knowing that every runner has a chance to place in the top three and make the Olympic team adds real excitement, and a smaller but stronger field means that the packs will remain tight longer into the race. If you’ve read this far, hopefully you haven’t forgotten to watch the women’s Trials tomorrow morning! As you tune in, think about what could make the Trials a more exciting, fan-friendly event and let me know your opinions. Bigger? Faster? Something else? Start line of the 2007 Healthy Paws Healthy Cause fun run. We all have to start somewhere. On January 1st, 2004 I went running for the first time in years. I made it just over a mile before I had to stop, gasping for breath and wondering if this former high school track and cross country guy could still call himself a runner! I set a few goals for myself and now here I am in 2008 with over a dozen running races and a few thousand miles underfoot since that humbling one-miler four years ago. What initially set me down this path wasn’t even running – it was softball. In the fall of 2003 I played on my company’s co-ed softball team and was embarrassed to find myself out of breath just by jogging out to center field! Back in my college intramural days I could run all over the outfield without feeling winded, so I decided to get back in shape and I chose running as the means. Running soon became the end, not just the means. I think a lot of runners can tell a similar tale of how just wanting to get in shape resulted in the discovery of a new passion for running. Ever since I have made sure to set many goals for myself, both for my running and for the rest of my life. These aren’t “resolutions”, mind you, but simply challenges to myself to remain focused in life. However, a deceptively severe hamstring strain has altered my plans. I don’t want to push myself to be ready for a spring marathon in case my hamstring doesn’t respond accordingly; plus, I haven’t been able to maintain an aerobic base over the winter like I’d been planning. So what do I do now? No problem. Adapt my goals – after all, goals are challenges, not “assignments”. My 2008 racing goal is simply to finish the Wild West 100K, which will be my second ultramarathon and the first at that distance. My previous ultra was in 2006 when I ran the North Country Trail 50M as my primary running goal for that year. If all goes well, I’ll parlay that training into a sub-4:00 marathon, perhaps the Grand Rapids Marathon. Clearly my time goals show that I’m not a competitive runner and my goals go beyond performance at races. In 2007 I ran 30% of my runs with a dog and I’m aiming to improve on that in 2008 with a goal of including a dog on at least a full one-third of my running sorties. Along those lines I want to increase my trail running totals by logging at least 25% of my miles on trails. In 2007 I managed 22% of my distance with dirt underfoot. I toyed with the idea of bumping this goal up to 33% but I didn’t want to force myself onto the trails. I enjoy exploring (both the countryside and the neighborhood) during my long runs and that usually leads me out onto the roads. Lastly, I have the goal of running 2008 without injury. Realistically that’s near impossible – there are always aches and pains to varying degrees – but towards that end I plan to be much more proactive in preventing injury via cross-training, stretching, and responding more urgently to any tweaks. I probably could’ve cut a couple weeks from my hamstring recovery time had I actively sought treatment right away rather than waiting a month, hoping for it to heal. Live and learn, which is another good reason for setting goals – it gives us a benchmark to measure our progress and allows for some instructive retrospective feedback for the next time we toe the line at the start of a new challenge in life. 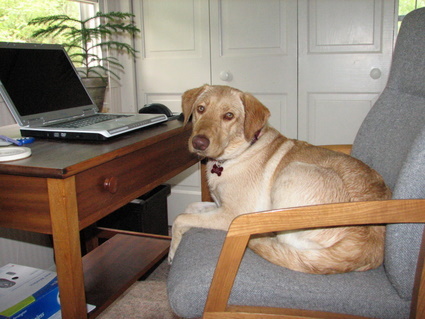 Ella updating her running log – she was my #1 foster dog running partner back in 2006. Congratulations if you’ve scrolled down this far and actually enjoyed reading the stats. The dogs will appreciate your effort since I’m now going to share their own personal numbers, which also include hikes and other walks that I didn’t include in my running tally. Note that “swimming” means time spent playing fetch in water or accompanying Amanda and I while we waded in the river. 1) Beacon likes running, Haven LOVES running. However, Beacon makes up for it with almost 6 more hours of swimming because while Haven likes fetch, Beacon LOVES fetch. 2) Beacon’s pads become sore rather easily and there are several occasions where Haven is taken for a run in place of Beacon because his paws are still recovering. We think the cause is a combination of Beacon’s naturally thin pads and his somewhat stiff-legged gait; in comparison Haven is a very smooth and easy runner. Yes, I love running with dogs! A year of good news and bad news, so I’ll get the bad stuff out of the way. 2007 ended not as I’d hoped thanks to my hamstring injury but at least it’s getting better with physical therapy. The downside was that I didn’t run a single mile during all of December, the first time I’ve missed a whole month since I started running four years ago today. The good news is that I had a great year of running yet again. I ran 13 races including a post-high-school PR in the 5K and then lowered that mark with the help of my dog. It was all part of 1018.5 miles underfoot in 2007 so despite the injury, I was happy to crack 1000 miles even if it’s just a number. One of my goals for the year was to run 250 times but I only reached 207; however, I probably would’ve hit my target if I’d been smart enough to not overtrain into an injury. Live and learn. Another positive is this very blog – since writing reason to run #1 back in April (which has been one of the most popular articles) there have been over 5200 visitors to Why Run?, much more than I would’ve thought my writing would attract. Thanks for reading! Looking forward to 2008 my first priority is to get running again. Before the hamstring acted up I was hoping to try for a marathon PR in May and do some serious training for a sub-4:00 finish. Hopefully I can still go for that, but right now the prime race on my radar this year is my first crack at the 100K distance in August. Aside from that event I’m still working on sorting out my race schedule but I won’t be racing as many 5Ks this time around. All three of those guys have made the U.S Olympic team for the marathon. Congratulations! TV coverage of the marathon trials can be seen on NBC today at 2pm Eastern. As a fellow Michigan runner, it’s great to see that two of those top three runners have Michigan connections: Ritzenhein grew up in nearby Rockford, Michigan and Sell trains in Rochester, Michigan as part of the fascinating Hansons-Brooks Distance Project. The news wasn’t all good for Michigan runners. Ryan Shay, a native of Ypsilanti, Michigan, collapsed early in the race and died. How awful. He had just been married on 7/7/07 this summer. In 2005 I ran my first ever 26.2 at the Grand Rapids Marathon; in 2006 I ran it again to set a personal best. At 2007’s 4th edition of this fast-growing race, instead of running I decided to volunteer along with Amanda. Believe it or not this was my first time volunteering at a running event, although last year I did volunteer for a GRAAR adventure race. Despite the Grand Rapids Marathon being a very well organized race, the confusion for Amanda and I began early when I offered to volunteer via their website’s volunteer form. The reply told us to arrive around 7am at the start/finish area and look for a certain woman who I’d never met. Without daylight savings in effect yet this year it was still pitch dark when we arrived at 7am Sunday morning but the start/finish area was already a bustle of activity. The large parking lot was completely full and Amanda and I had to double-park within the lot (along with dozens of other cars) since we were out of options. The start/finish area is actually a pretty big place – there’s the finish line, yes, but also the post-race food tent, the medical tent, the lock boxes, and of course the infamous porta-johns. Amanda followed me as we sought out some volunteers, finding them between the finish line and the food tent at some folding tables set up with the finisher medals on them – a team of young women were busy unwrapping each of the almost 3000 medals that would be needed that day. I asked for the name of the woman we were to meet there but nobody knew who she was! I finally found a guy who knew the coordinator and he whipped out his iPhone to give her a call. We were told to go meet her inside the YMCA building at the other end of the parking lot. Once inside we pushed through the throng of runners waiting to use the heated indoor restrooms (what a luxury compared to port-a-potties!) and I can’t blame them – it was barely above freezing outside! We made our way back to a folding table with a “volunteer registration” sign hanging from it. Why weren’t we directed to show up here? We signed in and were given our neon-green volunteer t-shirts and instructed to head back to the area we’d just come from. Back at the table with the medals there were about ten folks unpacking medals so Amanda and I were assigned to help two other guys who were preparing the space blankets. The marathon had purchased a dozen industrial-sized rolls of blankets – 200 blankets per roll like a giant roll of paper towel with perforations between the sheets. One at a time I had to pull out a length of blanket, tear at at the perforations, then fold it in half twice before stacking it onto a nearby table. It took me almost TWO HOURS to get through my first roll! Even worse was that I was the fastest one at the job thanks to my height – each blanket is 6 feet long and I was able to drag the entire length out of the roll’s dispenser slot in just one pull. My wife and others needed two pulls since their arms weren’t long enough. The race had just started and I knew that the first half-marathoners were going to finish in 1:15 or so… we had a long way to go! I looked around and noticed that all the girls were done unpacking the medals and just standing around. The volunteer coordinator was nowhere in sight. I suppose she couldn’t be everywhere, but nobody was in charge of the dozen or so folks in our area and no one had been given any instructions what to do next. Without really thinking about it, I started giving orders to set up a production line with the space blankets – two people per roll, one pulls and the other folds. Within five minutes everyone was hard at work and the stacks of folded space blankets began to grow quickly. Sure enough the winner of the half-marathon arrived just before 1:15 on the race clock and we had just polished off our final roll of space blankets. Whew! But now it was time for our next task: hand out those recently unpacked finishers’ medals and recently folded space blankets to each and every runner who crossed the line. This was the fun part of the day and it would last for hours. Race director Don Kern (who I’d met along with Dean Karnazes over a year ago) seems to have just one job at his marathon on race day – shake hands. He stood at the finish line and personally greeted every single runner as they crossed the finish. It’s a very nice gesture and I’d love to see other race directors do the same. As a volunteer I stood behind him with an armload of medals waiting to be handed out. Amanda was next to me with a pile of space blankets at her feet. Importantly, behind us were some volunteers wearing neon orange: the medical staff. They kept an eye out for finishers who were in bad shape, and with my running experience I was able to help them identify such folks. If you’ve run a few marathons and/or ultras, you know the difference between “exhausted beyond belief” and “borderline physical shutdown” – the former is OK (you’ll feel better in a few minutes) but the latter can be a risky situation if not handled properly. The look on a runner’s face can give them away; on some occasions I’d put a medal around somebody’s neck and then walk them straight over to a medical volunteer – if nothing else the medic would prevent them from falling over. One lady finished and I remarked to her that she looked very pale, and she replied “Oh my blood sugar is out of whack; I’m diabetic” like it was no big deal. The eyes of the medical volunteer nearby opened pretty wide when she said that! Needless to say that woman was taken care off without incident. One of my co-workers, Dave Horne, finished the half marathon in very good time and told me that he hadn’t slept in a couple days – all fun-related. 🙂 I also recognized and said hello to Lynn Happel, a veterinarian and the organizer of the Healthy Paws Healthy Cause fun run that I ran this summer with my dogs. She’s quite a runner! Before long the first marathoners were crossing the line and now us volunteers had to pay attention to bib colors since runners got different medals depending if they’d finished the marathon, half-marathon, or team relay. Both of my arms were now draped in medals and runners were crossing the line in bunches. I recognized a couple marathoners, too: Brian Cunningham is another co-worker and he proudly told me that he ran every step. Last year he cramped up and had to walk the last few miles, but it wasn’t easy for him – when we shook hands I noticed that his hand was as cold as ice! I also saw another veterinarian, Bruce Langlois, who appeared to have paced a friend of his through the race. Finally the last of the half-marathoners trickled in and now we were waiting for the folks running the full 26.2 miles. After about five hours elapsed race time the crush of finishers really thinned out; in fact some of the volunteers decided to leave as those of us remaining could easily handle the flow. Many of those clocking times of 3:30-4:30 were either disappointed with their time or had pushed themselves too hard – about 90% of those needing medical attention finished within that time span in my guesstimate. While the vast majority of runners of all speeds were generally cheerful (as chipper as one can be after a marathon, that is), the slower runners proved to be the happiest. These were the runners who had friends and family run alongside them down the final stretch and take their photos; many of these runners were streaming tears upon crossing the line (mostly women, but several men, too) and lots of them bypassed Don’s handshake in favor of a grateful bear hug. One of these finishers was Princess Runner, a blogger I’d never met until I recognized her outfit (she posted photos on her blog). By this time I had handed my medals off to someone else and was now doling out the space blankets so I offered one to Princess Runner. She was clearly very tired, but seemed quite happy to have earned her space blanket – this her first marathon after being forced to abandon at the Chicago Marathon disaster. We shook hands and like my friend Brian, her hand was ice cold! By this point it was sunny with temperatures in the mid 50s. I figured that this cold hands thing is the body’s response to the stress of a marathon, essentially saying “I know we’re not done yet but it’s time to start shutting down” to start the recovery. One of the last finishers managed to set a world record. How? He walked 26.2 miles on stilts! Neil Sauter was raising money to support those with cerebral palsy and sure enough he finished in under 7.5 hours. He was giving high fives at the finish and he had to bend over to reach most people; in fact little kids had to jump! The poor guy, however, had to remain up and walking around on his stilts for another half an hour as everyone wanted him to pose for photos. His legs must’ve been awfully worn out! One of the more memorable finishers for me was someone I have no clue about who she is, but she was bawling her eyes out and wailing “I can’t believe I finished my first marathon!” Her husband jogged the final stretch with her and at the finish they hugged for several minutes while she continued sobbing. A volunteer gave her the finisher’s medal and she burst into tears again. Then I put a space blanket around her shoulders and she says to me “Yay, I get to be wrapped in tin foil!” Apparently this is part of the marathon experience. As she staggered over to the food tent I noticed that her husband was chatting to an older couple behind the spectator barrier on the opposite side of the food tent. Deducing that those were her parents, I nudged her shoulder and turned her around – she started crying again and hobbled over to hug them! That is why marathons can be so inspiring – they mean different things to different people but each one of them had a very good reason. You can’t just run a marathon on a whim – you have to set the goal and train for it, and whether you’re fast or slow it still comes down to whether or not you can do it. In fact a TV crew interviewed Don Kern during the race and I overheard him state his belief that one reason to run a marathon is because if you can do that, you can do anything. Well Don, at least one runner believes you: one of the finishers yelled out “I ran a marathon, now I can do anything!” as a volunteer placed a medal around her neck. Running a marathon and volunteering at a marathon are night-and-day different but I have to admit that they’re about equal when it comes to pure enjoyment. Not only is running addicting, it’s also contagious! A marathon is supposed to be 26.2 miles, yet some 6,500 runners at the 2007 Chicago Marathon were forced to end their “marathon” after 16 miles. Officially the race was canceled due to record-high heat but reading between the lines, it appears that the race director called off the event due to poor planning by the organizers. Sadly, this is not the first time that the Chicago Marathon has suffered an embarrassing mistake that jeopardized the health of its runners. In the 2006 race, winner Robert Cheruiyot slipped as he crossed the finish line, losing his footing on a slick-surfaced sponsor logo placed on the road in front of the finish. Cheruiyot hit his head hard and was taken to the hospital; thankfully his injuries were not very serious. Why in the world would any race director allow such an obvious risk, especially given the wet conditions of that year’s race? 45,000 runners had signed up to attempt crossing that finish line and I find it appalling that safety was not a higher priority than the shininess of a sponsor’s logo. The logo was quickly removed and I’m not aware of any other runners who fell at the finish that year. Sadly that lack of planning in 2006 did not motivate the organizers to be any more proactive when planning for 2007. The possibility of record heat was known to forecasters at least two weeks in advance and it should’ve been a contingency scenario from the outset – one of the few things a race director cannot control is the weather. Many runners, aware of the heat, chose to not even start and save their efforts for a better day. According to MarathonGuide.com, there were “48,165 registered, 35,798 starters, 35,300 runners with a 10K split, 25,989 definitive finishers.” What really shocked me was MarathonGuide’s tally of the non-finishers: “1,000 runners who did not finish due to normal attrition, 6,500 runners who were removed from the course by race officials”. 6,500 runners forced to abandon! That’s 18% of all starters who were forced to cut short their dreams of finishing a marathon through no fault of their own. I’ve been following the blog of Princess Runner as she trained for her goal to run her first marathon. After setting her sights on Chicago 2007, she was one of those unlucky 6,500. She wrote about her frustrating experience, including: “The reality of what was happening suddenly hit me like a sledgehammer. I was not going to finish the marathon. I could do it, but the race officials were not going to let me.” How devastating. Her brother, Shore Turtle, also ran the marathon and was able to finish – he posted a respectable 4:13 – but had to endure seeing the letters “CXL” replacing the numbers on the race clock during the last mile. Many commenters on MarathonGuide.com related similar stories and sentiments about the 2007 race. What really angers me about the decision to cancel the race for those who didn’t reach halfway fast enough is that the Chicago Marathon caters in particular to that demographic of novice runners. I researched the results of dozens of marathons using MarathonGuide.com and found that the Chicago Marathon has the slowest average finishing time (4:35 in 2006, 5:02 in 2007) of any marathon I checked. With 45,000 registrants Chicago is one of the largest marathons in the world, but also one of the slowest. If record-high temperatures are combined with thousands of inexperienced runners, you had better expect a sharp increase in both water consumption and medical emergencies. Indeed, runners are responsible for their own preparation and I do find it annoying that so many folks allow themselves to get in over their head, but I was once one of those runners. I ran the 2005 Grand Rapids Marathon and was forced to walk almost 10 miles due to cramping caused by insufficient training. However, I was aware of my safety limits and the race organizers were well prepared for runners like me just in case I pushed myself too far. After all, even the elite runners can push a little too hard sometimes. Ironically, the Chicago Marathon also caters to the elites thanks to a large prize purse as well as being part of the World Marathon Majors series. Yet as Robert Cheruiyot can attest in 2006, Chicago has not been fully prepared to protect their safety. Fortunately nobody tried to blame Cheruiyot for losing his balance, but in 2007 race officials pointed their fingers at the novice runners that they’ve courted for years. Sponsor LaSalle Bank’s vice president inexplicably claimed that “planners did not anticipate runners would use drinking water to cool themselves” by pouring it on their heads. Oh really? At the 2007 Riverbank Run I watched aid station volunteers frequently use cups of water to treat runners with a refreshing “shower” despite a high temperature of just 67 degrees. Nobody planning for the Chicago Marathon could’ve thought of that? You are currently browsing the archives for the marathon category.